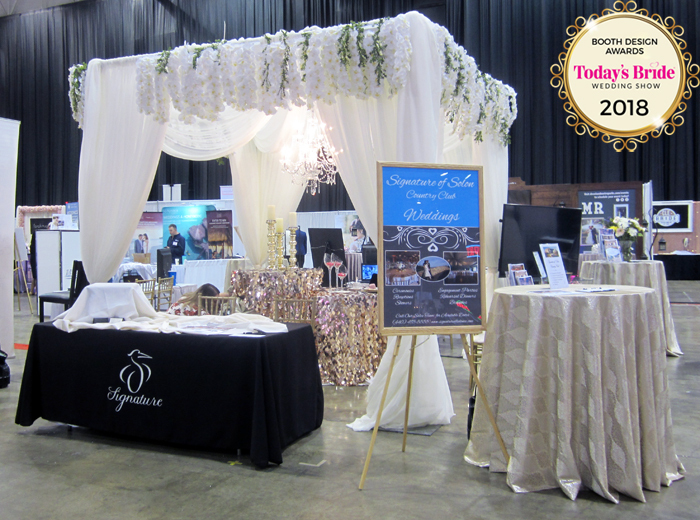 If we could give a Booth Design Award to every exhibitor at the I-X Center Today’s Bride Show, we would! Your designs made it so hard to narrow down the list of winners. 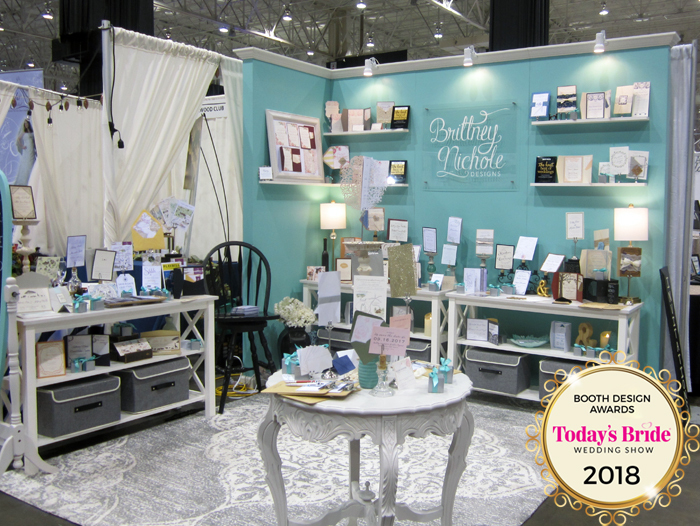 The following booths of both seasoned veterans and new exhibitors were creative, on-trend, and impressive! Well done to the winners and all the exhibitors at the Today’s Bride Show! Bartenza‘s display made us think of sunnier days. Days where you can grab a tasty cocktail at a hip spot in Cleveland and catch up with friends. The kind of place you can imagine having at your wedding! Their rustic wood accents, eclectic metal stools with industrial light fixtures, marquee letters, and luscious plant life created a modern atmosphere where brides wanted to stop, spend some time, and bring to their own wedding. When brides walked past Brittney Nichole‘s display, they were no longer at the I-X Center; They were transported to Brittney’s studio. Bright, inviting, and visual, Brittney did everything right. The modern graphic carpet paired well with the vintage table, and the color scheme was exciting, making them stand out. With different design options everywhere you looked, brides could easily find an invitation suite they loved. The balance of the masculine woodwork and stone with the feminine linens, candles, and greenery ensured that couples would be attracted to this display. The warm cottage-like feel is framed by their newest exhibit addition, the popular chalkboard signs featuring photos of events at the venue. Their staff adorned complementary shirts that shared the WEDDING LOVE that could be experienced at the Cleveland Metroparks. Open concept isn’t just a popular term on HGTV. 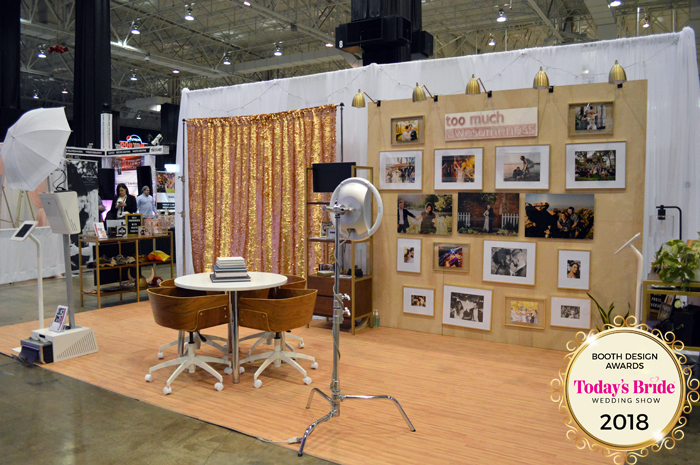 It can create a beautiful, welcoming bridal show booth space, too! 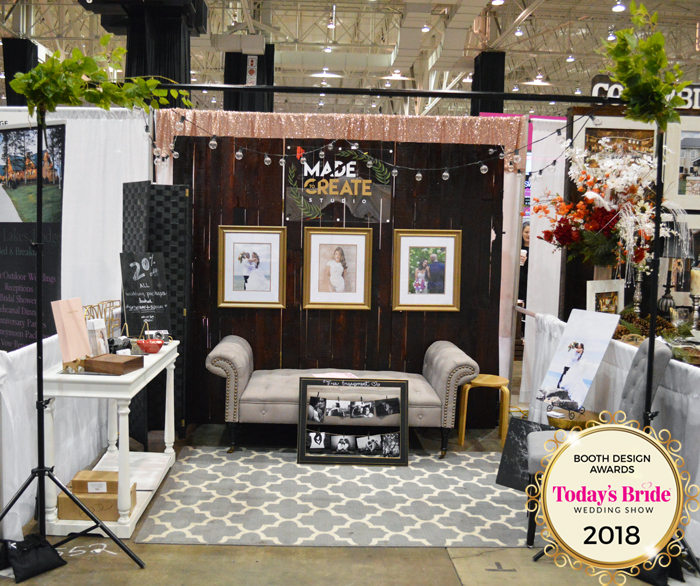 This double booth made an impression at the entrance of the show, and the color blocking background provided a perfect foundation to showcase a gorgeous array of bridal and bridesmaid gowns. 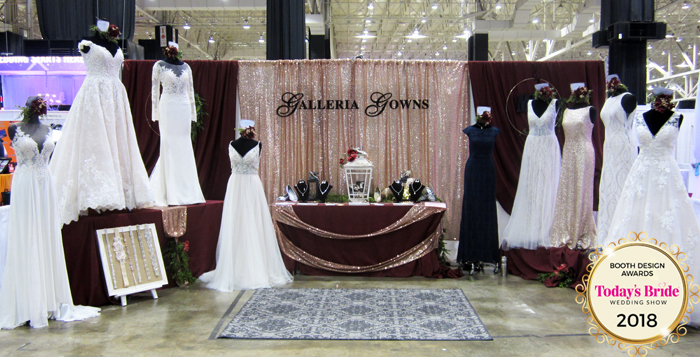 With all the dress and jewelry display, Galleria Gowns somehow managed to keep space in the center for selling to potential brides. 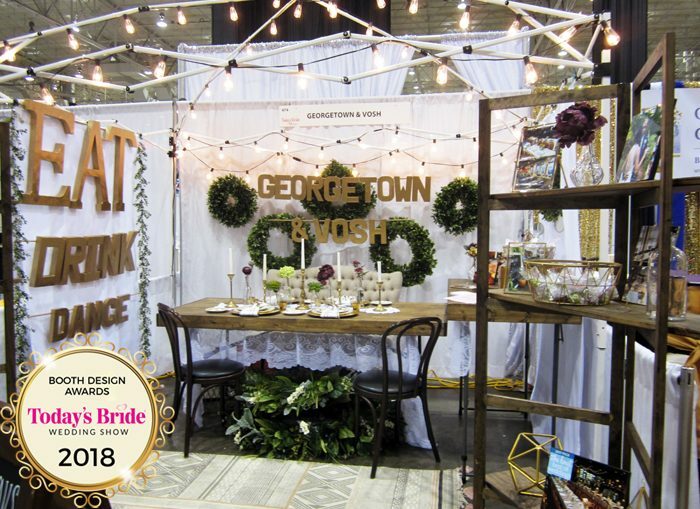 Sometimes less is more, but Georgetown & Vosh proved with their booth that sometimes more is more! 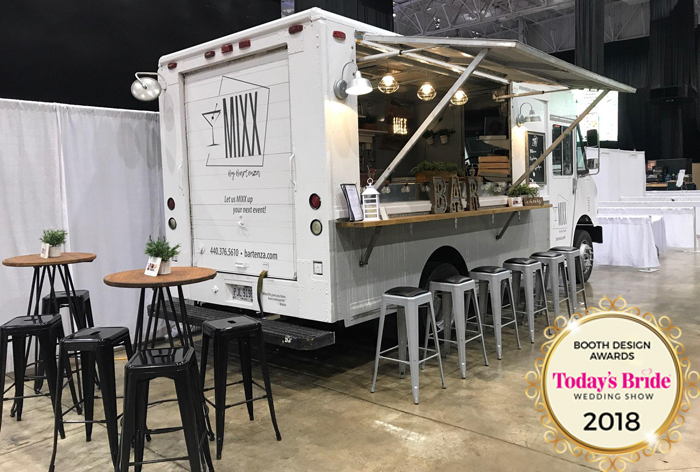 With something to look at everywhere you look – from decor to place settings and wall hangings to greenery – this all natural booth combined some of the most popular trends to create one cohesive look. Gold geometric shapes, twinkly lights, organic wooden tables and shelves, a bohemian woven rug, and live greenery came together to create this stunning space. Ken Love Photography created an art gallery in his 10′ x 20′ space. The corrugated steel backdrop featured photography art. The light-up marquee letters, industrial stools, and prominent signage all combined to give off a modern, contemporary feel – very on-trend and popular among millennials. Framing the space with a table on each side allowed him the perfect opportunity to engage attendees from either side of the booth. 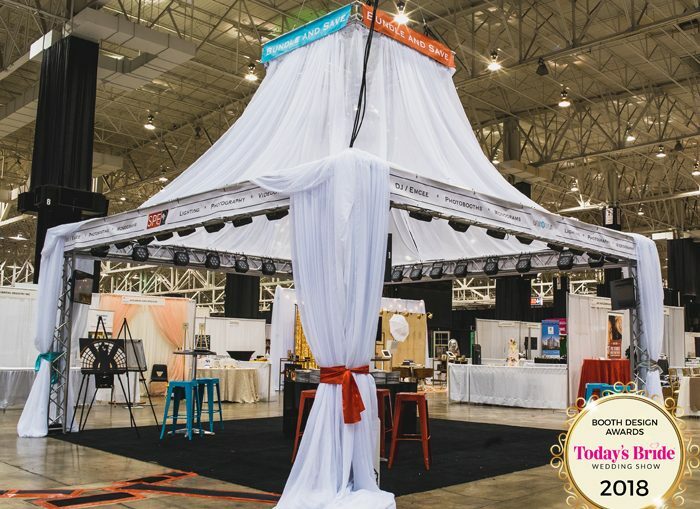 This eye-catching structure caught the attention of brides as soon as they entered the show. The LaCentre exhibit was enhanced with ethereal and romantic sheer drapes, an opulent chandelier, and hanging florals, exuding class and luxury. Signage and literature was prominent and accessible for brides. Though each side represented a different venue, and therefore had a different style, elegance was a consistent theme among the four entry points. Why follow trends when you can set trends? 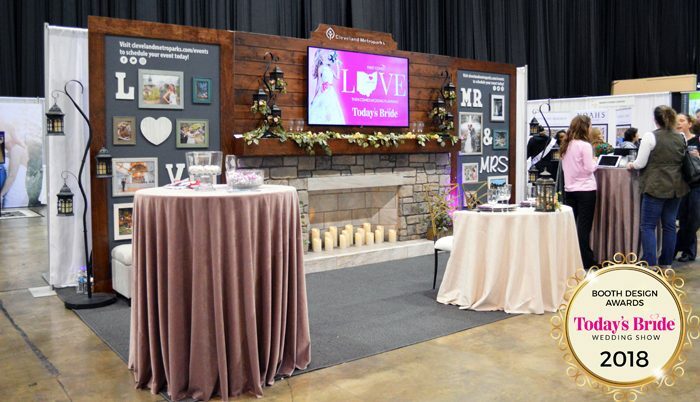 Bringing the latest technology to weddings and bridal shows alike, Limelights Entertainment impressed the attendees with their display of services. 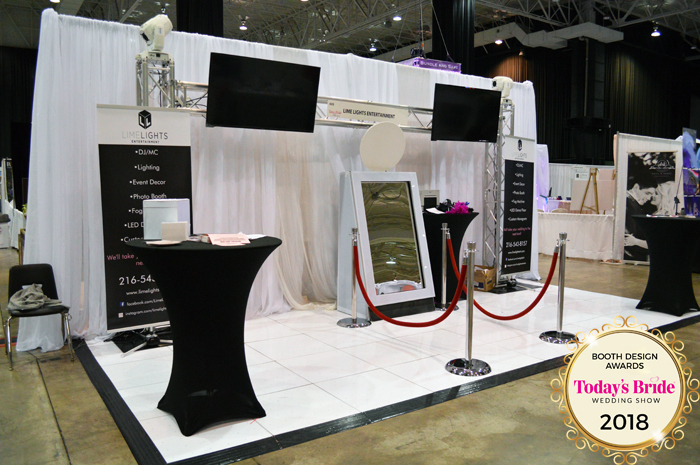 A fun mirror booth framed in by red stanchions encouraged brides to pose for the paparazzi while the LED dance floor was impossible to not dance on! Add in roaming lights, visual monitors, and prominent signage, and you have one successful booth! Makeup by Madison & Co. Makeup by Madison was proving her talent and skills live, in-person, and on-the-spot! Brides could experience her talents first-hand with demos or view them via photos. A dramatic backdrop, comfy rug, great lighting, trendy sign, and large banners helped in creating a posh and interactive space with endless possibilities. 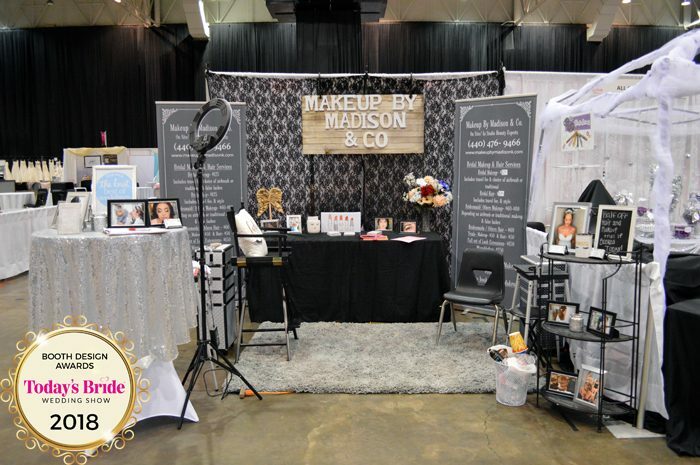 Madison was successful with a mini booth in the previous year. She wanted more space and took a chance investing in a larger, single booth. Good gamble – she tripled her success before move-out! Rock The House Entertainment never ceases to surprise and impress! 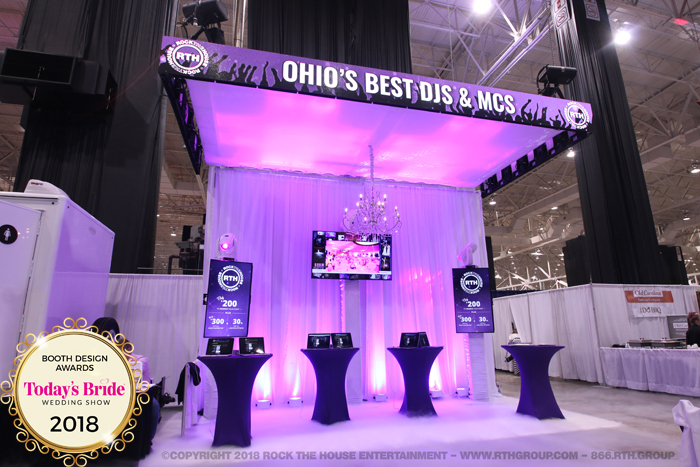 Just when we think they couldn’t create a more eye-catching and attention stealing booth, they raise the bar higher! The scrolling LED news bar ticker at the top of their booth ensured that everyone could see them – even from aisles away! The white carpet and drapery were the perfect backdrops for their uplighting. With a classy chandelier and monitors prominently displaying their show special, this space was high-class all the way! Height! Drama! Color! Lighting! The Sound Precision Entertainment Quad booth had it all PLUS a disco ball! With lights surrounding the space to reflect off the disco ball, music playing, and a wide open space, brides and grooms flocked to this booth for a dance or two. Pair the colorful stools and ribbons with the uplighting of the white linen, and throw in a few monitors displaying their four services (DJ/MC, videography, photography, photo booth) and you get an exhibit that astounds and inspires! Thanks to Lauren Conrad, balloon arches are about to be the new big thing, and The Dress Bridal Boutique is ahead of the curve with their backdrop! Their balloon backdrop drew your eye to their company name, ensuring the bride wouldn’t forget. The gold sequined linen, lucite chairs, and array of balloons played off the texture found in each of their gorgeous dresses. 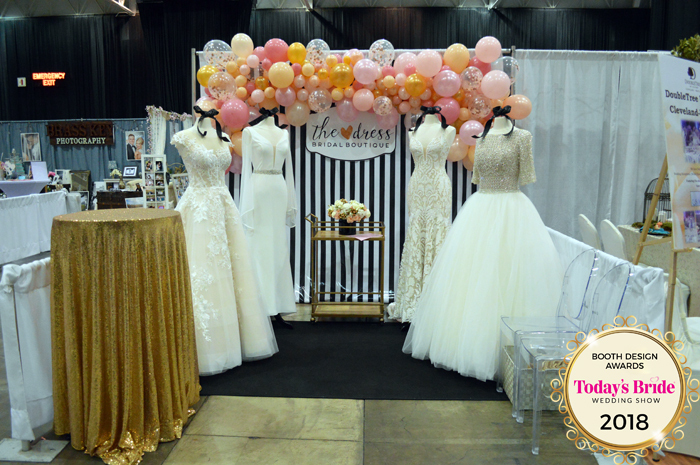 Mimicking the sleek and chic appeal of Kate Spade, The Dress’s booth was colorful, classy, and on-trend. too much awesomeness may be a new exhibitor to the Today’s Bride Shows, but he came as prepared as a seasoned-vet! Taking advantage of the space of a double booth, one side featured a gallery wall displaying gorgeous examples of his work while the other allowed couples to experience the photo-taking process first-hand! Throw in a casual and hip place to discuss availability and rates, and you’ve got yourself a killer booth design.